The customary climate summit, held every year to draw an agreeable framework to lower worldwide greenhouse gas emissions, has seldom been a success. 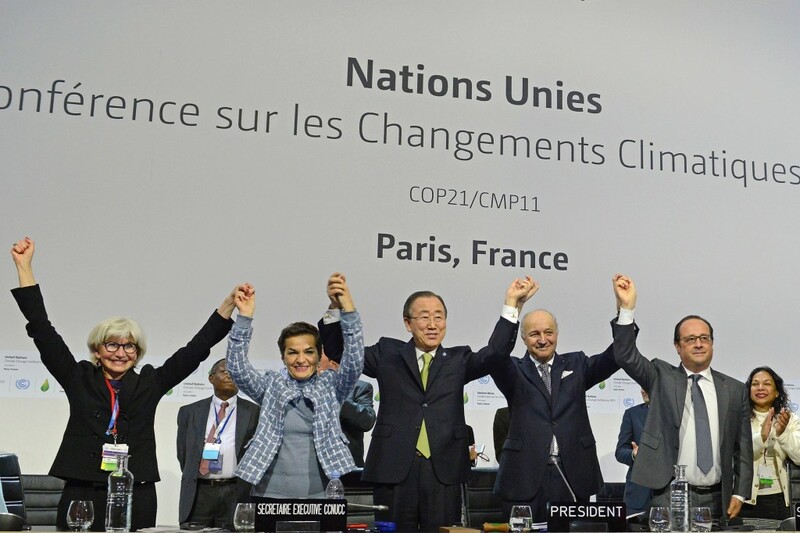 However, the Paris Climate Change Convention, known as COP-21, broke the jinx. Held during the final days of 2015, the Paris climate summit saw as many as 196 countries agreeing to adopt clean energy sources to lower carbon emissions and contain global warming. The convention produced an agreement that all nations, developed and underdeveloped, will limit global temperature increases to 2 degree Celsius and an aim to further limit it to 1.5 degree Celsius. This was in accordance with the clause mandated under Kyoto protocol. Despite being transformative, the `Paris Agreement’ cannot claim to see the end of fossil fuel altogether. Interestingly, the carbon reduction commitments will kick in five years later, in 2020. The Paris Agreement states it will become binding only when countries accounting for 55% of global greenhouse emissions join in. In April this year, as many as 34 countries accounting for 49% greenhouse gas emissions formally committed to adhering to the agreement, bringing it closer to the critical threshold of making it operational. Academics around the world say the ‘Paris deal’ flagged as a super success is actually flawed. Many scientists have dismissed the Paris solution saying it gives false hope. Instead, a number of them believe that the time has come to manipulate earth’s climate system by adopting the controversial geoengineering technologies. The UN Climate Conference should have trained its sight on adopting climate-change mechanisms suitable for all. Instead, such summits have always remained rigid in believing that the contribution of rapid industrialization in the past is irrelevant. According to aid charity group Oxfam, the cost of climate adaptation measures cited at the Paris Conference remains prohibitive for poor nations. It states that the governments must return to the negotiating table before the new agreement takes effect from 2020 to strengthen the pledges of emission cuts and agree to new finance levels. Oxfam reminds that the wealthy nations had vowed to help poorer countries cover the cost of investing in climate-saving measures such as designing drought-resistant crops, etc, but not much has happened on that front. It claims that the rich nations have not fully honoured the pledge taken in 2009 Copenhagen summit to help poorer countries adapt to climate change and cut carbon emissions by providing US$100 billion annually. Of that US$100 billion a year pledged, only 16% has been paid so far. While a recent OECD report claims the wealthy nations are providing US$62 billion every year, critics rubbish such claims saying the double counting of existing loans and aids make the figure look big. According to a UN report, adapting to climate change could cost as high as US$500 billion per year by 2050. The Kyoto Protocol adopted in Kyoto on December 11, 1997, is an international agreement and an extension of the United Nations Framework Convention on Climate Change (UNFCCC) that commits the members to cut down on greenhouse emissions. The protocol assumes and recognizes the existence of global warming and blames man-made carbon dioxide as its root cause. India is among the 192 countries that have signed and ratified the Kyoto Protocol. When a big chunk of the world agrees that climate change is for real and decides to fight the menace unitedly, the issue must have some merit. But the cost of keeping the planet safe is very high for the not-so-developed nations. Although India has agreed to cut down its carbon emission output per unit of economic activity, there is no denying the fact that it feels cornered by the global climate politics. For instance, India wants the review period for such activity to be held every 10 years, but the affluent nations are fine with a five-year review. India is also resisting undue pressures and bullying tactics adopted by the advanced countries for achieving the desired goal. The legally binding clause has severe repercussion on emerging economies like India, which is banking on the fossil fuel coal, regarded as a key agent of climate destruction, to produce electricity. So when India was told it cannot step into the shoes of the US, Europe, and China by burning an absurd amount of coal, India retorted that it could stop doing so if rich nations offer fat climate aid of over US$160 billion every year to fill the gap. Early in 2015, analysts had warned that growth in India and China would exponentially raise emission discharge. However, India accounts for as little as 3% of global greenhouse emissions annually, way below neighbouring China’s 28% and United States’ 27%. India rightfully wants the developed nations to take ownership of the global warming induced by heavy industrializing in the past as well as accept responsibility for the incremental use of energy in the future. But the bullying nature of member nations comes to the fore when they insist that all countries should contribute equally to prevent global warming. Experts say this approach is extremely flawed because accepting such a clause would keep poorer nations poor and underdeveloped for an extended period of time in future. For instance, fossil fuel like coal is regarded as a key element responsible for climate destruction. But India needs to significantly increase the use of coal to generate power. Electricity is critical for developing any economy and India is not rich enough to invest in clean energy drives in tandem with the developed economies. Despite that, it is doing its bit in that area too. The total apathy of the handful of industrialized nations towards the development needs of countries like India is appalling. Fossil fuel is a relatively cheap source of energy and is expected to be in use for many more years to come. India is in the throes of a big demographic change. It is a young country with a substantial size of its population hovering around the age of 30. This highlights the fact that massive job opportunities are required to be created every year for it to become a prosperous nation. However, the cost of building basic infrastructure to support India’s economic goals and raise the standard of living cannot be done without ample generation of electricity. India has over 300 million people, around 24% of the global population, living without electricity. In 2011, India consumed only 0.6 ton of oil equivalent (toe) per capita on an average, which was much lower than the global average of 1.88 toe per capita. Here, it should also be noted that India has an abysmally low score in Human Development Index (HDI), holding the 135th position in the global ranking. The United Nations Development Program (UNDP) defines the Human Development Index as a summary measure of average achievement on key dimensions of human development: a long and healthy life, being knowledgeable and having a decent standard of living. The UN states that HDI was created to highlight that people and their capabilities should be the crucial criteria for assessing the development of a country and not economic growth alone. Countries with very high human development have an HDI of 0.9 as compared to India’s 0.586. However, for any country to achieve a 0.9 HDI or more, uninterrupted annual supply of at least 4 toe per capita is required. So armed with only 0.6 toe per capita if India is dithering to bite the bullet on the Convention’s hard and binding clauses, the reason is legitimate. Indians or citizens of any other developing or under-developed nation have the same right to a dignified life as their rich counterparts. Thus, India needs a massive quantum of energy to undertake its gigantic development plans, and therein lies the big climate problem. Just before the Paris convention, it was decided that member countries would draw individual plans under the umbrella of Intended Nationally Determined Contributions (INDC) to tackle carbon emissions. India in its INDC plan said it is game for increasing its use of non-fossil fuel manifold aided by technology and cheaper international finance. In fact, India is brave enough to project that by 2030, the fossil fuel free (FFF) energy will contribute 40% of its total energy needs. In September 2015, Prime Minister Narendra Modi had pointed out that India’s energy efficiency focus will lead to a sustainable path of prosperity. True to its commitment, India has started to focus on renewable energy sources like wind and solar. India is currently ranked as the fifth largest wind power producer in the world and has a target of achieving 60 GW of wind power installed capacity by 2022. The government has also undertaken an ambitious solar expansion project. It aims to develop numerous solar parks, ultra mega solar power projects, and solar pumps. Additionally, the government has solarized 3,135 petrol pumps and aims to bring all the 55,000 petrol pumps under the scheme. Besides, there are efforts to promote the use of biomass energy, hydropower and also nuclear energy. If the present government can accept the challenge and deliver, not only will it benefit the solar and wind energy companies but it also has the potential to displace equivalent to the entire emissions of South Africa in 2030. As such, this would indeed be a significant global contribution. But India is not sitting idle. It realizes that lowering the use of coal will benefit local environment. In accordance with the clean coal policy, the government has undertaken many initiatives to cut carbon footprints of coal-based power plants and make them more efficient. The modern, large, coal-based power generating stations have been ordered to lower carbon emissions with the help of technology. Simultaneously, the existing coal-based plants are being modernized in phases. The government has also set energy-efficient targets for 144 old thermal stations and is looking to introduce further stringent emission norms. Alongside, there are talks to launch ultra-supercritical technology that will be made available to the plants. Many experts have suggested that the countries devise a strategy in which rich countries pay for their past and recognize the energy needs of the weaker economies. In case, efforts are sincere and motives are free of bias, then it would not be difficult to find ways wherein individual nations chalk out their individual needs to go for low-carbon alternatives. To its credit, India is actively pursuing a policy of exploiting the benefits of renewable energy both to address climate change and promote economic growth. It has voluntarily agreed to lower the emissions intensity of its GDP by 20% to 25% over the 2005 levels, by the year 2020. This entry was posted in blog on August 17, 2016 by admin. India does not need to be so stringent on climate change because we are not the ones who have polluted the global environment. Let developed nations take the responsibility first. The climate fund of 100 billion dollars seems to be far and there is urgent need that countries like Bangladesh, India and others are supported through other multilateral organisations like UN and World Bank. It is true that our per capita pollution is very less as compared to China or United States. But why not prove to be a role model for others. Indian politicians ‘protect’ a lot of labor and business interests either from each other or from foreign competition. It’s pretty difficult for a country like the US to offer money to a country that wastes it’s opportunities so flagrantly. One suspects that the reason why India is claiming it needs to burn coal is to protect coal miners, and it may in fact diminish it’s coal use as renewable resources come on-stream. The experience of US companies in India is various collections of ‘local content’ laws, 51% local ownership, tariffs, and so forth. Every obstruction put in the way of a rational business process is a reason not to enter the market at all. It appears that the only time that India ‘loosens up’ is when it’s on the verge of financial ruin, as happened in the 1990s. It will take centuries to reform at that rate. I see hope in governments target of 175 GW energy through clean means by 2022. This is because solar energy prices are coming down very rapidly and our nuclear capacity is also increasing. Agriculture is still a leading employment sector in India. And if the world doesn’t think about rising temperatures and extreme weather events then India will suffer maximum damage. Why cant India think of making quick decisions and green nod to genetically modified seeds so that we can at least be confident of good crop years in rain deficient years? Stringent norms for thermal power houses can only work when there are strict checks and supervision. Ganga is being polluted since decades and industries enjoy impunity. Primary target for PM Modi should be poverty eradication and social inclusion rather than earmaking money for climate change. We cannot think of unpolluted air with people dying of hunger. China and India are on same stage with China just more developed now. Asian countries must lobby for their rights in United Nations along with Africa and other LDCs. Nothing is legally binding today. China is not bothered about International Tribunals verdict on south china sea. Even Paris deal may end in such manner. We must have our own targets and commitments. Hello there. I could have sworn I have been to your blog befofe but after browsing through a few of the posts I realized it is new to me. Regardless, I am certainly happy I ?tumbled upon it an? I will be book-marking it and checking back regularly.